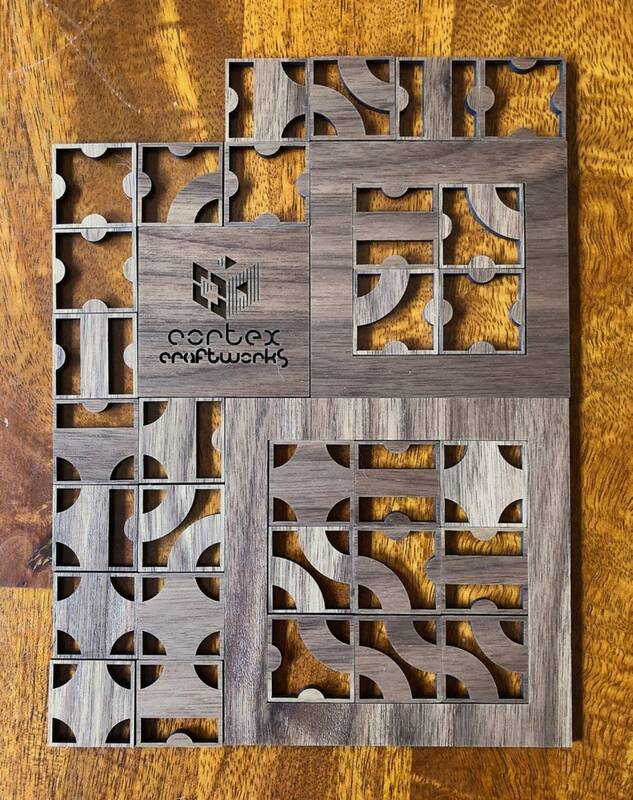 This is a set of small, laser-carved square tiles, with six distinct designs that tile together no matter how you arrange them to create complex curving paths. Carefully lay out design ideas, or re-arrange the tiles at random to see what patterns emerge. All tiles and frames in a set are cut from the same material. You can choose from one of several finished solid hardwood materials with natural wood grain patterns (every set will be unique! ), or glossy acrylic for a shiny, uniform look. Sets are all cut to the same scale; multiple sets of path tiles in various shapes and materials will work together. Note: these are small items with pointy corners! They're not appropriate for very small children. They're also a little delicate and may not stand up to rough handling; for not-very-small children and other folks with fine motor challenges, the acrylic tiles are a somewhat more durable option than the wooden tiles. Very nicely made and solid feeling. Love the sampler pack, thanks!